The Yemeni Parliament condemned the meeting of a number of members of the Council in the Yemeni southern city of Sayun in Hadramout province. Those members live abroad in countries participating in the aggressive war against Yemen, such as Saudi Arabia and the UAE. The pro-aggression council members were paid by the aggression that is led by Saudi Arabia, with the support of the United States of America to convene a session in the Sayun city, Hadramout governorate. The House of Representatives considered in today’s session that the convening of an illegal session in Sayun, a violation of the Constitution and the Council’s internal and organizational rules for the work of the Council and its various composition that was even organized by an outgoing president. A statement stated by the Council pointed out that the meeting in Sayun coincided with tight security measures, where Saudi military forces were brought to the country. The outcomes of this resulted in terrorizing citizens, creating a state of panic in their midst and instability and the aggravation of public tranquility .. Indicating that the purpose of this meeting is to allow the forces of the coalition of aggression to enter and occupy Yemen. The statement also explained that this military presence of the forces of aggression is considered a constitutional violation that requires an issue of who ordered this meeting, organized and attended the meeting, claiming to represent the people on behalf of the House of Representatives. 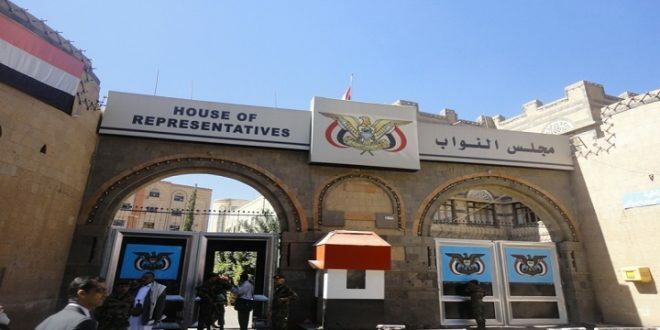 The House of Representatives confirmed that the Constitution of the Republic of Yemen and the internal rules of the Council state that the place of the House of Representatives is merely in the capital Sana’a and any meeting outside the capital is invalid, unconstitutional and illegal. The House of Representatives pointed out that the measures taken in this meeting are invalid and illegitimate, stressing that the proper steps for the participation of these members are only by them appealing to the countries of the aggression that is led by Saudi Arabia to open Sana’a International Airport so they can join their colleagues in the capital Sana’a who hold regular meetings and exercise their legislative duties in the light of the Constitution and the internal regulations that manage the work of the Council and its various configurations. The statement pointed out that there is no legitimacy for any actions that violate the constitution and the internal rules of the council, warning against using this meeting to legitimize crimes and plots of the aggression that affect Yemen’s sovereignty, independence and territorial integrity. The House believes that the members of the Council who are outside Yemen and who’ve been faithful to the aggression should review their positions towards this aggression that has been committing massacres against the people of Yemen and affects the children, women and the elderly and in all places that constitute the elements of life and they must hold their conscience accountable and put the supreme national interest at the forefront of all interests, to find a peaceful and democratic option and a political solution to spare Yemen from more woes, blood, and destruction. The House of Representatives also considers that the members of the Council together must put all the points of divergence of views and differences on the table of discussions to take decisions that are positive and are in the interest of Yemen, away from the dictates and interference of the countries participating in this aggressive coalition from our internal affairs. The House of Representatives pointed out that what happened to Yemen from the destruction and violations that have affected every house and every family, calling on everyone to do what’s right and to unite in order to build a new Yemen in the light of visions and exits agreed upon by all without exception. The Council invited all its members in previous sessions and still has its hand extended to all without exception because the Yemeni homeland is available for all its people. The Council of Representatives expressed thanks and appreciation to its members abroad who are committed to the spirit of the Constitution and the law and have not been dragged by Saudi bribes to attend the convened session in the Sayun city, urging the United Nations to secure their return to the homeland. The Parliament of the Republic of Yemen appealed to the Inter-Parliamentary Union, all parliaments in fraternal and friendly countries, the United Nations with all its institutions, bodies and organizations and the special UN envoy to Yemen not to recognize the parliamentary Sayun session because it infringed the constitution and laws of the Yemeni Republic. Furthermore, the Deputy Minister of Foreign Affairs Hussein al-Azzi said that the people are the source of legitimacy, and recognizes only the steadfast parliaments who stood by their homeland, their people and the representatives who were elected yesterday. “We the people are the source of legitimacy and as a Yemeni, I only recognize the steadfast Parliaments with their homeland and their people, this includes the new MPs who were elected today,” he said in reference to the vacant parliamentary seat elections held Saturday in 24 constituencies. “There are two legal cases to remove MPs from the membership of the House of Representatives, the first is dropping the membership that calls for certain actions by the Council, and the second is the fall of the membership automatically as soon as the availability of reason, such as alignment with the capitals attacking Yemen. The deputy foreign minister added that the fools dropped their membership and the right of Parliament to prepare again for a supplementary election.